During a time of tragedy it’s never easy to consider financial burdens. Luckily, that’s what community is for. After one such event, one of our Give users compared the results of two recent fundraisers to tell us why they switched to Give from GoFundMe. 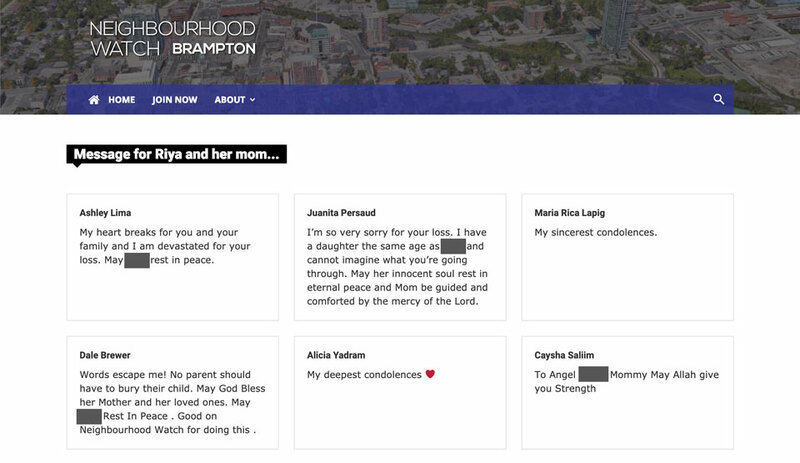 Recently, the city of Brampton in Ontario, Canada was shaken by tragedies of the worst kinds. Earlier this year, they witnessed the tragic death of a little girl far too young. 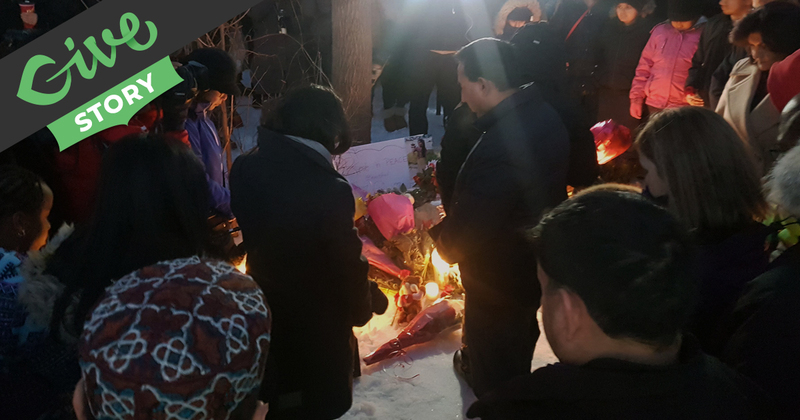 Just as your own neighbors would, their community rallied around the family and the local Neighbourhood Watch started a memorial fundraiser. I opened my phone one Monday morning to a Tweet about a fundraising campaign so shockingly successful that I almost missed the story behind it. @GiveWP, your plugin took us a few minutes to install and configure on Friday. We've since collected nearly $35,000 in memory of an 11 year that was killed by her dad. Thank you! On Valentine’s Day, an 11-year old was killed by her father. 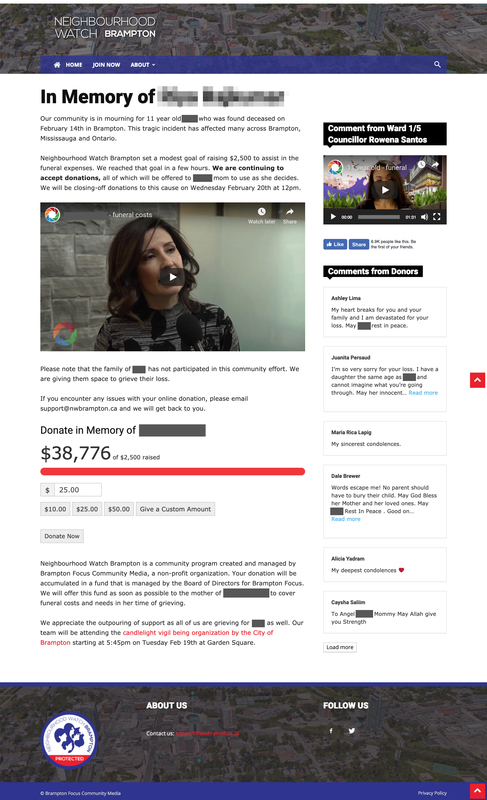 The next day, Brampton Neighbourhood Watch installed Give on their website and started a memorial fundraiser. Just 5 days later, they had raised over $40,000 dollars for her mother. Less than two weeks afterward, the funds were transferred and the family received the only consolation their community could give them: unwavering support and a large check – an extremely large check in this case. 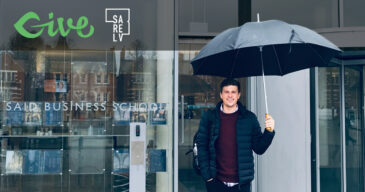 By the time the campaign ended and Stripe’s credit card processing fees were taken out, they had raised $40,650 from 1,320 donors across Canada. The support from the community was staggering. We received their Give Story submission a short while later and I was even more amazed at what it said. Not only had their campaign blown up overnight, they also held a similar fundraiser 7 months earlier on GoFundMe that wasn’t nearly as successful. In July of last year, a 5-year old boy who had been reported missing was found clinging to life near the train tracks in Brampton. He was beaten and needed critical medical attention. The town rallied around him, too. Brampton Neighbourhood Watch started a GoFundMe campaign for the boy with a goal of $10,000. In the end, they received $2,532, hardly a fraction of what they were able to raise with Give. It’s not the norm, but it’s one example of issues people run into with GoFundMe campaigns. Another is the issue of donor confusion and the amount of options there are for campaigns to give to. In this case, there were actually three campaigns for the boy. One campaign was started by the boy’s uncle and the other was started by someone who appears to be another family member or friend. Brampton Neighbourhood Watch thought that their status as a legitimate nonprofit would help provide credibility, but that wasn’t the case. In the end, all three campaigns combined generated a total of $13,052 from 2,064 donors. Only $2,532 of that amount went to the Neighbourhood Watch Campaign. There are a lot of reasons that these fundraisers may have had different outcomes. But below are a few troubles we hear from users like Brampton Neighbourhood Watch often. While both events were covered by the media, there was one small difference in reporting. The GoFundMe campaign linked to in many articles about the boy was different from the one organized by Brampton Neighbourhood Watch. This explains the lack of contributions to the campaign started by the Neighbourhood Watch. It also may have caused confusion about whether or not each campaign was legitimate. There were three fundraisers available to give to, which makes the donation process much more complicated and causes donor trust to decline. Gaining donor trust is important to get more donations. We’ve talked about gaining donor trust with transparency in the past, but this goes beyond that. When it comes to giving online, people need to trust the site they’re on. Donors who donate directly on your website they know exactly who they are donating towards and how the funds will be used — trust is amplified. There have been a lot of questions about the validity of GoFundMe campaigns after a homeless man was used as a “heartwarming” story for one couple to scam $400,000 away from thousands of donors. GoFundMe refunded all the donors and stands by their policy, but the situation raised a lot of questions. In fact, when I was comparing all three GoFundMe campaigns, I started to question the legitimacy of all three fundraisers because I saw duplicates. Even though I knew the organization personally — which one was legitimate and were there fakes? Less donors on a single campaign. The average donation for the Give-powered campaign was about $30 after credit card fees are removed. The average donation for all the GoFundMe campaigns without the credit card processing fees removed was only $6.32. As it turns out, GoFundMe had the same questions I did initially and it ended up causing a delay for the organization to receive their funds. Perhaps if Brampton had coordinated to ensure there was only one GoFundMe campaign, they might have gotten their funds more quickly and eve raised more. But, then again, maybe not. They have no control over whether or not someone else starts a campaign for the same purpose. 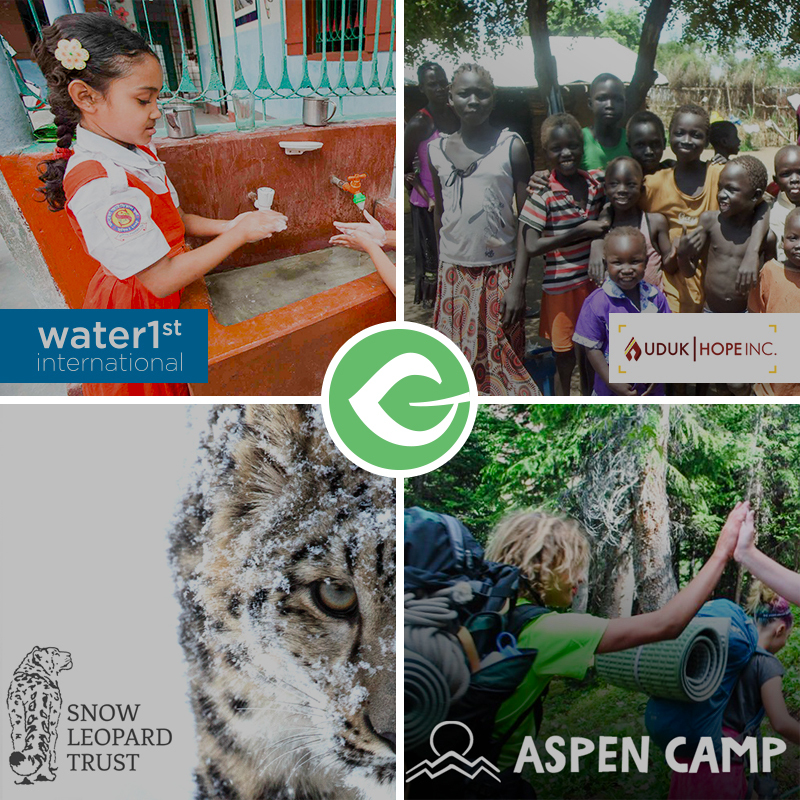 With Give, the organization had full control over the memorial fundraiser donations through their payment gateway immediately. Their donors also knew that the funds went to the intended cause. If anyone questioned the website, they could check the legitimacy with a few simple steps. All three of the above factors potentially created the environment necessary to reach $40,650. 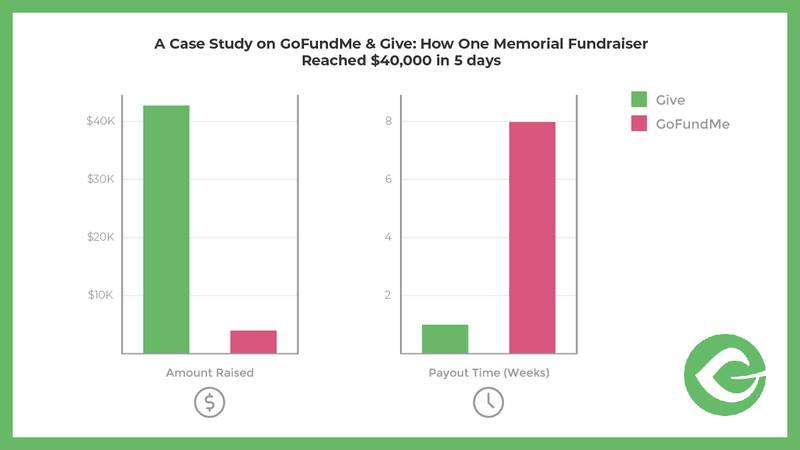 The change to Give generated 1,500% more funds to give to the grieving mother than the GoFundMe campaign did to contribute to the boy’s medical expenses. All of us at #TeamGive are extremely thankful to be part of a community when they needed it most. If you need to raise money for a personal cause, like a medical emergency or a memorial fund, consider Give. Schedule a demo with our Customer Success Team to see everything Give can do for you. Or simply get started with our free plugin. After a quick online search, we discovered GiveWP. The website and demo’s were excellent and we opted to install the plug-in and purchase the Stripe integration. It could not have been easier. We created a brief video for the donation page and shared it on Facebook and Twitter in hopes of raising $2,500 within a few days to assist in funeral costs. The GiveWP plugin had all of the core features that we wanted, including the ability for donors to leave messages. 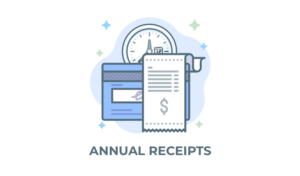 The credit card check-out process was easy, the reporting was great and the automated emails worked perfectly. Within a few hours we had raised the $2,500 goal and were getting messages from donors to keep it running. We kept it running and by the next morning we were close to $10,000 in funding. Local media started interviewing us and by the end of the 2nd day, we had reached $20,000. We were able to update the messaging to let donors know that all of the funds would still being going to the mom. In total so far, we have raised $35,000 for the mom. Give WP allowed us to create a professional looking campaign but also have much more control, especially after the fact in determining where donations were coming from. As well, our credit card processor deposits our funds within a week, which we hope brings some small measure of comfort to the grieving mom. Your plug-in, combined with our established presence in our city allowed us to quickly build credibility with the media and local community leaders. We utilized social media, especially Facebook for promotion (all organic). We didn’t even have time to utilize our email list. To achieve 10x what we expected was more than enough. Thank you for creating a great solution!